Carved Wood Address Sign with Pine Trees - - personalized carved pine wood address sign. Wall mount. Nature-theme address sign displays the family name and address. Made in USA. 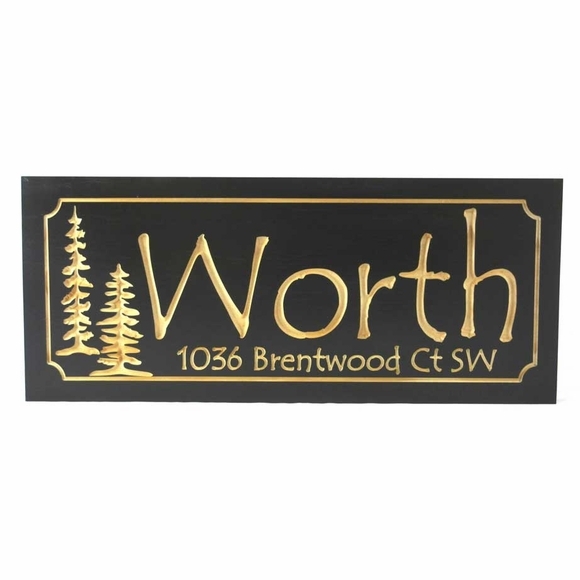 Two line address sign customized with the wording you supply and the edge style you select. Solid pine construction. Black finish with carved personalization, trees, and border that all take on a golden hue as a result of the carving process. Great for a hunting lodge, mountain cabin, country retreat, or wherever you want to add a glimpse of nature. Name line holds up to six (6) large letters. Address line holds up to 20 characters in a smaller size. Name line holds up to seven (7) letters. Address line holds up to twenty-two (22) characters. Name line holds up to nine (9) letters. Address line holds up to twenty-four (24) characters. Please make sure to order the sign size that is large enough for the personalization character count. (NOTE: you do not have to fill the entire input box.) Leave the four unused input boxes empty. Color: black with natural text and clear-coat sealer. This finish is a black painted background with natural wood carved lettering and objects. The natural wood carved portions provide a nice contrast with the black background. A personalized address sign is always a thoughtful housewarming present and a meaningful gift for real estate agents to give at a house closing.